One man is on a mission to prove that it's possible to make (good) living farming. 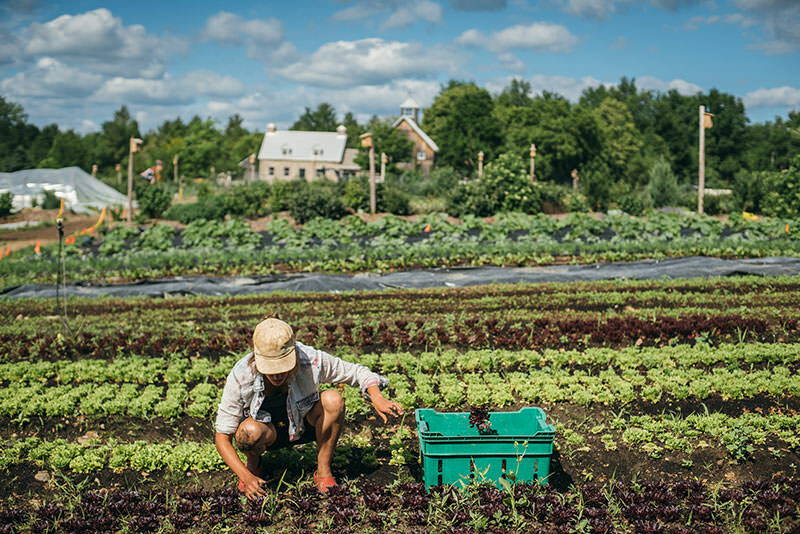 A worker harvests lettuce at Jean-Martin Fortier's new venture, Ferme des Quatre-Temps. Of course, making six figures farming isn’t generally impossible – with enough capital, enough land, in the right situation, theoretically anyone could do it. What makes Fortier somewhat unique is that on his 1.5 acre vegetable farm in Quebec, for the better part of a decade, he has claimed that amount per acre. Contrasted with corn or soybean farmers, for example, who may average somewhere between $400 and $600 an acre – or even the average CSA farmer who often brings in less than $40,000 per acre of vegetables – these numbers don’t just make farming look reasonable, but viable. They’re the sort of numbers that, no matter what kind of farmer you are, you drag yourself across state lines to see the guy who’s doing it. 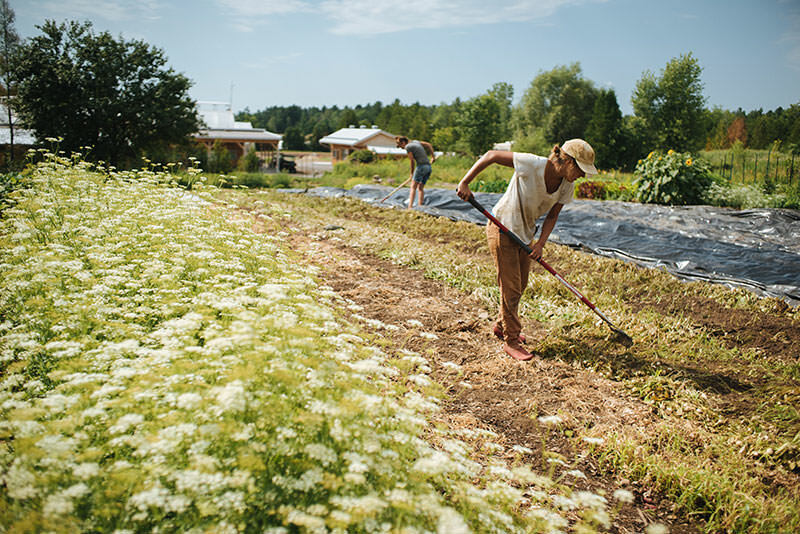 This tour began following the release of Fortier’s book, The Market Gardener: A Successful Grower’s Handbook for Small-Scale Organic Farming, in 2012. Originally published in French, the book details the methods Fortier and his wife Maude-HélÁ¨ne Desroches utilize to reach those numbers on their Quebec farm, Les Jardins de la Grelinette (roughly: “Broadfork Gardens”). Since the book’s release, it has been translated into English and Korean, and is currently being translated into German, Dutch, and Polish. It has sold more than 70,000 copies worldwide, according to Fortier. This demo at Rosecreek is just one of more than 200 demos he’s done, many of which sold out weeks before. The book acts as a “follow up,” says Fortier, to famed farmer Eliot Coleman’s classic The New Organic Grower, originally published in the late 1980s. Like Coleman, Fortier puts heavy emphasis on semi-permanent raised beds, small machinery, hand tools, and biointensive growing – that is, spacing vegetables tightly to fit more of them into a smaller area, often planting multiple crops a year in the same space. But with its refined focus on these methods, as well as planning and profit, The Market Gardener has endeared itself to a new generation of back-to-the-landers running into the sobering reality that making money selling food is just hard. It’s expensive to get started, it’s long hours, it’s low pay. Through his book and workshops, however, Fortier is saying firmly: It doesn’t have to be. BCS walk-behind tractors, for instance – the only tractor-like machinery Fortier uses – have been “enjoying double digit growth in sales” every year since 2014, says BCS America general manager Larry Seymour. According to Adam Lemieux of Johnny’s Selected Seeds, many of the tools Fortier promotes are up anywhere from 6 percent to 60 percent in the last year alone. Perhaps the most dramatic correlation is the Tilther – a $495 soil preparation tool featured on the cover of his book”“”“which has jumped 366 percent over two years. As for the farmers, Christian La Bar of Colorado’s Two Roots Farm calls the book a “lightbulb.” Feeling overworked a couple years ago, La Bar says, “I was definitely captivated by it, by him, and by his focus on achieving a quality lifestyle.” By following The Market Gardener nearly “to a T, with some other ideas mixed in,” Two Roots is likely to gross around $75,000 on a half acre in its first full year of business, La Bar says. “The Market Gardener was huge for us,” adds Elliot Seldner of Fair Share Farm in Winston-Salem, North Carolina. At Fair Share, Seldner employs much of what he calls the “The Market Gardener Blueprint.” By switching to Fortier’s recommended 30-inch beds, broadforking, and composting by hand, among other adjustments, Seldner has seen a dramatic uptick in sales. “We’re super small, we were able to do $50,000 gross sales, and we’re on track for a little over $100,000 [this year],” he says. Of course, not everyone who has tried Fortier’s methods has found the quality lifestyle they’d hoped for. 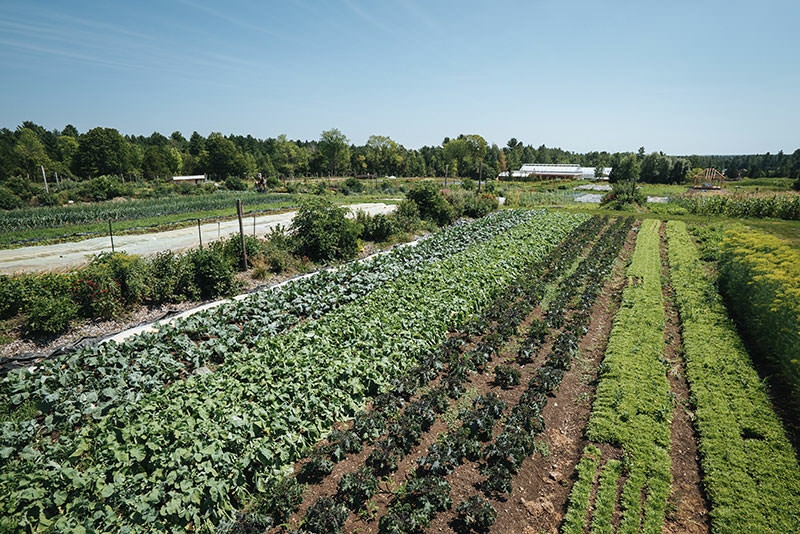 “It’s definitely not a black-and-white success story for our farm,” concedes Matthew Coffay of North Carolina’s Second Spring Market Garden, despite having made more than $100,000 in his first year of farming professionally through a focus on winter production and a Community Supported Agriculture (CSA) program. Though Coffay says it felt like a success story for a while, he and his partner were working seventy-plus hour weeks, “even in the winter,” and soon hit a wall. “I think we just kind of underestimated how long we were going to be able to work these hours to keep that level of production going,” he says. Coffay is not alone. Though there are those who have ditched the tractor for Fortier’s low-tech methods and seen their sales leap and workloads level out – some even surpassing Fortier, like farmer Erich Schultz of Steadfast Farm in Arizona who claims gross sales closer to $200,000 an acre – there are those like Coffay who have had to adapt. Fortier is even working to address the problem of undercapitalized farming with a sort of “turnkey” approach. 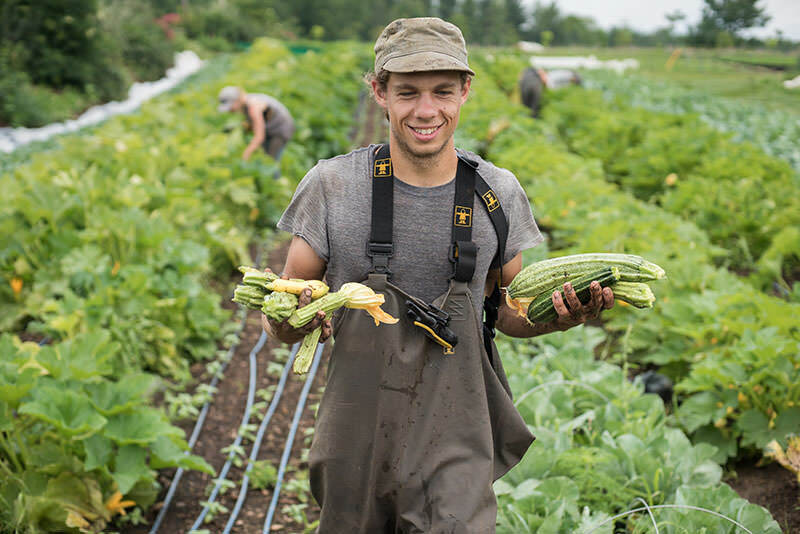 This idea started at his new project, Ferme des Quatre-Temps (Four Seasons Farm), where Fortier is farms operation director, overseeing a team of eight apprentices-employees. They took a full season to set up the farm before beginning to grow – something most young farmers could never afford to do. Teaming up with wealthy Canadian business mogul André Desmarais, Fortier is setting up new farms, creating the infrastructure, and setting up the irrigation and beds. After designing and building Ferme des Quatre-Temps last year, the farm is now in its first production year, selling produce and eggs at three farmers markets, as well as to some of Montreal’s best restaurants. 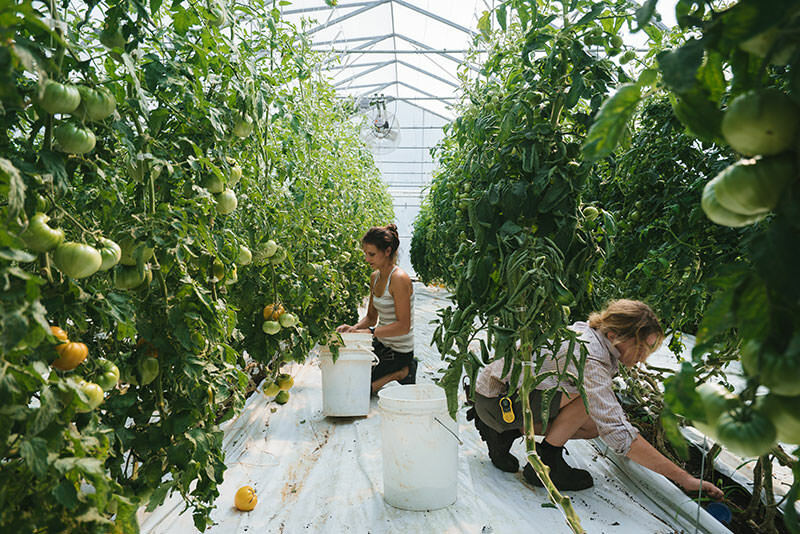 Coffay, though still employing some of Fortier’s concepts, is opting to reduce his acreage even further, drop the CSA, and move more towards the methodology of another popular figure in this microfarm movement, urban farmer Curtis Stone. For his part, Stone focuses on high-value crops in city plots, and sells to CSAs, farmers markets, and restaurants. Though his book The Urban Farmer still similarly emphasizes minimal machinery and biointensive growing, Stone sticks to the highest profit crops – baby greens, microgreens, and tomatoes, for example. Where Fortier is willing to grow some slower, lower-profit crops like broccoli and cabbage, this high-profit approach has earned Stone high numbers too, sometimes on as little as a third of an acre. Stone’s popularity, in fact, has likewise made him a formidable driver of sales, as confirmed by several tool suppliers. Ultimately, with urbanization gobbling up forty acres every hour of farmland yearly, and larger farms devouring much of the remainder, this question of scaleability may be relevant for reasons beyond finance. Farmland under ten acres may one day be some of the only land available – microfarms could quite literally be the small farms of the future. Though if it’s a matter of fewer hours for better money, as evidenced by this group in Selmer, Tennessee, farmers don’t need the future to convince them. Farmers are ready now. I have the same vision, just no capital to get started again. In Southern California this is easily achieved and tomatoes can return at least $250K per year when sold at local markets. At $1 per pound it only takes 10 pounds per plant to reach $250K. In 2003 I grew 600+ plants that produced 1000 pounds per week from mid May to August averaging about 15 pounds per plant from 36 varieties of heirloom tomatoes. Some varieties averages over 25 pounds per plant. I used greenhouse trellising idea with open air on a northern slope. Will this method be able to integrate with things like 1/10 acre farming?